Mr Fluff puts his best face forward to bring you the best male grooming products on the market. With Christmas fast approaching this might give you a few ideas for the men in your life! Week day mornings are rarely something to be looked forward to and no matter how I dress it up, a new moisturiser isn’t going to change that. But, along with a few other products, it might make them that little bit more bearable so I decided to try out some of the newer ranges of men’s skincare lines on the market. To try and wake myself up I use Bulldog Natural Original Face Scrub (€7.25), from a range I really like. I was genuinely surprised to find out the price of this one as I reckon it could compete with the higher end brands and must offer the best value for money on the male grooming market at the moment. The scrub itself gives excellent results with the added bonus of being free from added chemicals and, in a first for men’s skincare, is approved ‘cruelty free’ by BUAV. The range also includes Shave Gel (€4.99), Face Wash (€6.49), Sensitive Moisturiser (€8.75), Anti-Aging Moisturiser (€12.99), After Shave Balm (€7.25) and an Eye Roll On (€12.49). Next, to speed things along, I broke open Kiehls Facial Fuel Sky Flyin’ Foaming Multi-Gel (€16). I’m all for this trend towards multi purpose products and this one, which can be used both as a face wash and as a shaving gel, does not disappoint. It's very foamy compared to standard face washes although this may just be my under estimation of how little you really need to use. It’s very effective for both jobs with my skin feeling smooth and cleansed afterwards and the gel having a particularly appealing citrusy fragrance. Lastly, and arguably most importantly, it’s time for post shave moisturising. For this I chose Korres Light Weight Aftershave Balm (€18.73) from their Men’s Care Reloaded range. This was absorbed into the skin quickly and easily, which for me is an essential feature, leaving it feeling refreshed and firm. I think Korres have got the fragrance just about right in that it’s manly in an old school kind of way but still fresh and, crucially for an aftershave balm, subtle thus avoiding straying into 80’s aftershave (Hai Karate anyone?) territory. Other products in this range include a Shave Cream (€23.73), Facial Fluid Cleanser (€18.73), Anti-Ageing Cream (€27.47), Anti-Shine Moisturiser (€23.73) and Toning and Strengthening Shampoo (€11.24). So after all that I’m afraid I have to report that stepping out into a dark, windy and wet Dublin at 8 am was still horrendous. But, I did feel that little bit more prepared to face (geddit??) the day ahead, and at that time in the morning I need all the help I can get. What are your current skincare favourites, for you or for the men in your life? Psst! If you could do with expanding your skincare collection, do check back to the site this afternoon for the latest giveaway! It is really cool to see that dual purpose cleansers and shaving gels work! Thanks for the report Mr. Fluff! Great report...I'm going to get Ian to have a read of this! Thanks mr.fluff. Great post! I will have to show my brother this. lol. It would be great to see you check out my blog. We could maybe follow each other if you like it. My guy is all for the Dr. Weil series from Origins. he tried several other brands but ultimately always came back to this one even though it´s pricey but he - finally - realized that sometimes it´s better to pay a little extra and be happy than to get samples-crazy. I am totally different. I loved Origins for years but then my skin went crazy and it took me a while to settle my skin on something again. Right now I am in love with Bobbi Brown skincare and my skin improved dramatically, too! Great post! I'm glad to see a man skincare products review, so I can advice to my fiancee since he doesn't read blogs:) I found also a lot of info in the previous comments, which is a great help too. Oh I wish I could convince my husband! Getting him to moisturise is hard work! 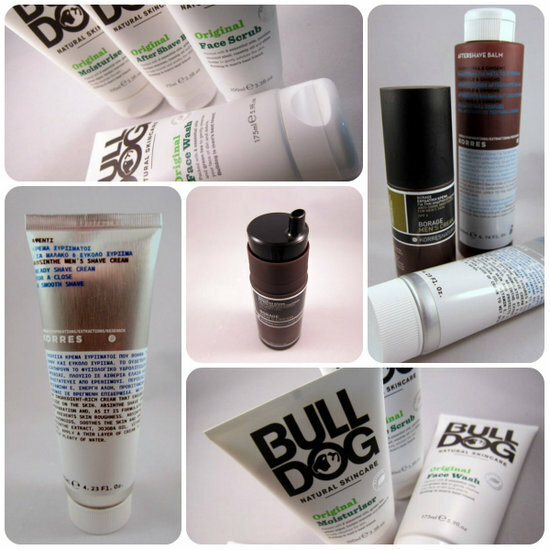 My boyfriend is using the Bulldog Sensitive Moisturiser and loves it. There's very few products he can use that don't irritate his skin so he's delighted he found it. Mr fluff is a trooper! I love that he was willing to try the product and let you take a picture!! Very few guys would agree to it! I like the occasional Mr Fluff reviews! This post has reminded me that soon it's Christmas and that buying skincare products for my Mr could be a good idea. Love the soapy-smell of Kiehls for men! I have a list of my own skin care favorites since I love trying out different skin care products. Hmmm...I think is is good for my hubby. I'll tell him about it. My husband recently started taking his skin care routine more seriously. He’s been using the line from Garden Girl http://www.gardengirlskincare.com/g-for-men-natural-skin-care/ and he looks amazing!